My apologies for how quiet it's been around here. I have a whole slew of excuses including having recently moved, being out of town, forgetting to bring my camera with me, being sick (again) and just a general lack of inspiration. I haven't been excited about getting dressed recently. I'm not too worried, though, as I've definitely gone through these phases in the past, and they usually don't last long. A change of season always helps, and fall is on the horizon. Your dress is so cute!! Stunning! You are so incredibly pretty. I agree with all of the previous commenters about your lip color. It really looks gorgeous with your dress. Adorable little summer dress! I'm getting in a style rut too. I understand. The fall just needs to get here soon. 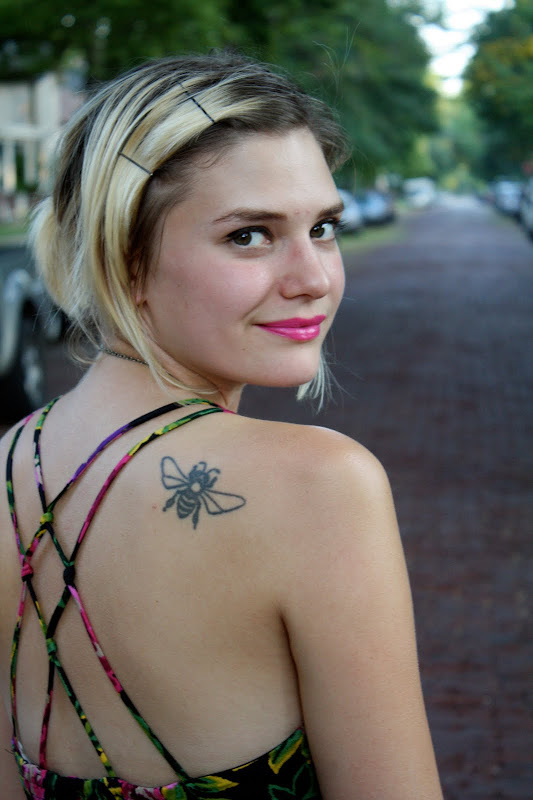 I love how your bee necklace matches your tattoo. How cool. Really cute dress. I love the back of it. I too have been kind of blah about dressing, but I think it is because of the horrid heat here in Kansas this summer. It is hard to get inthused about anything except staying in the a/c. Gorgeous necklace!! 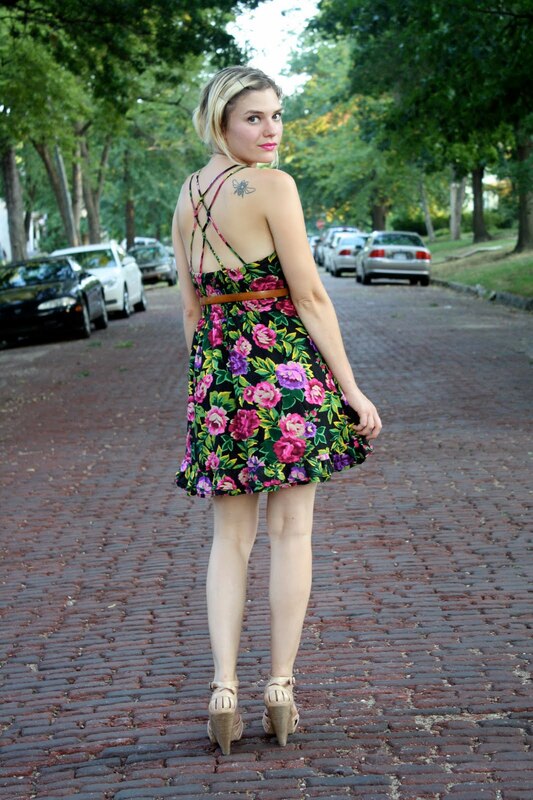 And the dress is super cute:) I've had those uninspired moments too. Usually a little wardrobe redo is what helps my creative juices. I aodre that little bug necklace you have on soo cute! The dress is pretty fab too. 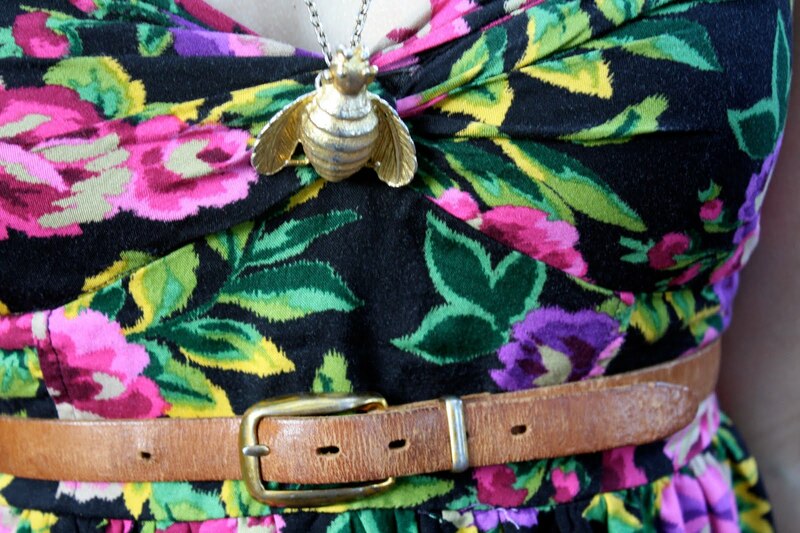 The bee necklace & your wonderful tattoo are perfect with the little floral print dress! Also, I like how you're standing on a cobblestone road, it's rare to find them here in Chicago (usually I'll see a cobblestone alley in an older area). pretty dress, and love the shoes! that last picture of you close-up is very beautiful, katy!